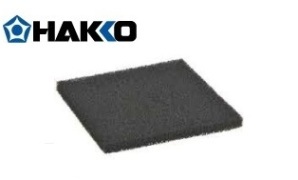 Hakko Replacement Activated Carbon Filter.  5 filters per package.  Filter size: 5.1 x 5.1 x 0.4" ( 130 x 130 x 10mm).  Maximum absorption .01lb (4g).  For use with the FA400 and 493 smoke absorbers.